Chiropractic is a science, philosophy, and art, based on a powerful premise. The body is a self-healing, self regulating mechanism. (You cut your finger- it heals. You cut a corps’s finger, it doesn’t.) It is life itself that heals. The NERVE SYSTEM is the master system of the body. The brain and spinal cord communicate with every organ, tissue, and structure in the body through a series of nerves. 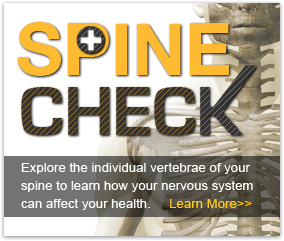 These nerves exit the spinal column through the freely movable vertebrae of the spine. When your body is overwhelmed by physical, chemical and emotional stressors, a SUBLUXATION can happen. This results in interference in nerve system function. Now the vast majority of subluxations that happen—your body spontaneously self corrects. But it’s the ones that don’t self correct, require application of a specific force at a specific time to give it the nudge it needs to reset the system. Doctors of chiropractic are specially trained to identify subluxations, and correct them through specific chiropractic adjustments. This facilitates proper nervous system function. As a result, the body is more capable of fighting infections and healing properly. Your doctor of chiropractic is devoted to your optimal wellness. Your chiropractor does not promote or prescribe surgery or drugs. Instead, they use a non-invasive, non-drug approach to improving the health and well being of their patients. Chiropractic is the #1 alternative health care choice. More and more research is published everyday about the effectiveness of various nutritional supplements. But how do you know what brands are safe and pure? How much do you take? Is the research from a legitimate source? At Horizon Family Chiropractic we create custom, non-drug programs to treat things like: Irritable bowel syndrome, food allergies, chronic fatigue syndrome, fibromyalgia, asthma, autoimmune disease, male and female hormone issues. We’ll work with you in recommending and implementing lifestyle changes, incorporating nutritional supplements and diet changes. The Thermal Scan is used to assess the part of your nervous system that helps to control your organs, glands, and blood vessels, the autonomic system. The instrument does this by precisely measuring differences in temperature along the spine. Since proper function of your organs, glands, and blood vessels is essential to healing and living well, this test gives your doctor a ‘snapshot’ of how this portion of your nervous system is working and how it is responding to care. The PWP or Pulse Wave Profiler helps the doctor to determine your overall ability to adapt to the environment. It does this by looking at the timing of your pulse, and determining the balance and tone of your nervous system. This exam is known as heart rate variability. Proper balance and tone are associated with better adaptability and a healthy lifestyle. Low heart rate variability is associated with aging and poor heart health. Published research has shown that chiropractic adjustments have a beneficial effect on heart rate variability. The CranioSacral system is comprised of the membranes and cerebrospinal fluid which form the fluid-filled sac around the core of the nervous system – surrounding, nourishing, and protecting the brain and spinal cord. Like the pulse of the cardiovascular system, the CranioSacral system has a rhythm that can be felt throughout the body. Using a touch generally no heavier than the weight of a small coin, skilled practitioners can monitor this rhythm at key body areas to pinpoint the source of an obstruction or stress. Once a source has been determined, they can assist the natural movement of the fluid and related soft tissue to help the body self-correct. This simple action is often all it takes to remove a restriction. Other times, CST may be combined with other complementary therapies to help restore the body to it’s optimum functioning level. Kinesio Taping® is an extremely versatile rehabilitative therapy utilized to re-educate the neuromuscular system, promote lymphatic flow, reduce pain, enhance performance, prevent injury, and promote injury resolution. The Kinesio Taping® Method is applied over muscles to reduce pain and inflammation, relax overused or tired muscles, and support muscles in movement on a 24-hour-a-day basis with no worry of latex sensitivity. It is not a restrictive type of taping and allows for full range of motion. In contrast, traditional sports taping is wrapped around a joint strictly for stabilization and support during an athletic event. Kinesio® Tex Tape is used to treat anything from headaches to foot problems and everything in-between. Examples include rehabilitation from sports injuries, carpal tunnel syndrome, lower back strain/pain (subluxation, herniated disc), knee and shoulder conditions, and many more.